iPhone or a Samsung Phone: Which One Should You Buy? Some of the best smartphones on the market are made by Apple and Samsung. In the last year, we've seen the iPhone XS, iPhone XS Max, and iPhone XR, as well as the Samsung Galaxy S9, Galaxy S9 Plus, and Galaxy Note 9. If you're unsure which brand you should choose for your best device, this guide can help. Here are some things to consider when deciding between an iPhone or a Samsung phone. Continuity with other Apple devices. Doesn't work well with devices running other popular systems including Android, Windows, or ChromeOS. A new iPhone may be ideal if you're already in the Apple ecosystem with a Mac desktop, MacBook, or iPad. Users can start activities or projects on one Apple device and continue where they left off on another. Apple's Airdrop feature also makes it extremely easy for users to transfer files from one iOS or macOS device to another. Additionally, Apple Watches are only compatible with iOS and other Apple devices and software, so if you wanted to get that particular smartwatch, you'd need an iPhone to fully take advantage of it. Users can set up apps and programs like TWRP Custom Recovery to have more advanced customization access. Trying to gain root access to a device can render it unusable if not done correctly. Samsung has customized its user interface so it's different from other Android devices. Older devices run the Samsung Experience UI, while newer devices running Android Pie use the One UI. Samsung's new interface is minimalistic, intuitive, and more task focused, helping users spend less time looking for apps and functions, and more time doing what they actually want with their devices. Design wise, Samsung users can take advantage of the theme library and create their own themes to give their devices a unique look. More advanced users can root their Samsung device and install custom recovery firmware, allowing them to have access to the back end of a device. Many people use these methods to install leaked updates or apps and programs not native to Samsung devices. There's some risk in performing such functions, but some people like knowing they're able to do it. Users can depend on iOS updates releasing in a timely fashion for all compatible devices. Users may have to wait out bugs and other small issues as they're patched with smaller updates. Many iPhone users really like that when the latest iOS update is released, it's available to all compatible devices at the same time. It takes just a few months for the majority of iOS users update to the latest system version. Most Samsung devices only get the latest Android system version when it's first released. Users can manually add more storage if their internal storage doesn't suffice. MicroSD cards for expandable storage are typically sold separately. Many Samsung users really like using microSD cards to expand the storage amount on their devices. The latest smartphones allow users to expand their internal storage up to 256GB or 512GB. Prices vary depending on the brand and capacity, but microSD cards are often on sale at stores like Best Buy and Target. Samsung also occasionally offers deals to get a free microSD card with the purchase of a new device. iOS users are typically the first to know about the latest new app craze. No real downside to this feature. Apps typically release and update on iPhones before other devices because developers find it easier to create on iOS; many developers may wait until apps become popular on iOS before attempting to build an Android version. If you want to make sure you have access to the latest apps, the iPhone is the better choice for you. Samsung hasn't adopted the top-notch design. Replacing broken or damaged screens can be costly. If you get a Samsung device, you can be sure it will have one of the best displays on the market. Samsung's OLED displays are known for their rich color and detail and are guaranteed on all Galaxy S and Galaxy Note models. OLED displays are great for watching videos and displaying pictures. While the super premium iPhones also have OLED displays, if you want a lower cost or older iPhone, you may have to settle for an LCD display, which isn't as bright and has less color variation. Users don't have to waste time closing apps for better performance. iOS navigation can be challenging. Many people enjoy how iPhones seem to run fast and smooth, with few instances of freezing or crashing. High-performance functions, such as gaming, watching videos, or having several apps open at once doesn't slow an iPhone down either. Some iPhone navigation and gestures may be challenging for those who are not familiar with iOS, but they're easy to learn. Samsung devices tend to have longer daily battery life with average use. High-performance users may still experience battery drain. Despite fumbles from the past, Samsung devices tend to have pretty decent battery life due to their large batteries. The Galaxy S and Galaxy Note smartphones also support quick charging, so if your battery does dip to a lower percentage than you're comfortable with, it only takes a few minutes to get most of your power back. Users that stay away from risky behaviors are relatively safe. Major native bugs can lay dormant for some time. Apple devices are known for their high level of security. While they're not foolproof, users who avoid risky practices can easily keep their iPhones free of bugs and viruses. Users can also keep iPhones safe by keeping iOS up to date, not installing unauthorized apps, services, or programs, and having strong passwords. Great for low light photography. Can struggle to capture image and video detail, especially in third-party apps. Samsung has improved the quality of its cameras significantly over the years. Samsung mobile cameras are some of the best among Android devices. Some of its top functions include a wide angle mode, low light-HDR, and a scene optimizer, which adjusts the camera settings to get the ideal shot based on the subject. High Dynamic Range features are superb. Low light images can still be lackluster. Cameras on the iPhone still shine for practical functions. Many users find it easier to get a first time shot with an iPhone, where images don't suffer from a lack of detail or overexposure. Features like Live Photos are popular for sharing, as they capture three-second gifs, and iPhone cameras are also ideal for capturing images and video on third-party apps like Instagram, Twitter, and Snapchat. Users can still use a standard 3.5mm audio jack with the latest Samsung devices. Samsung's flagships are some of the only premium smartphones to still include 3.5mm audio jacks. There's no telling how long this will last, but for now, the Galaxy Note 9, Galaxy S9, and Galaxy S9+ all feature headphone jacks. Samsung Galaxy S9 headphone jack. All of Samsung's older devices also include headphone jacks; the Galaxy Note 8, Galaxy S8, and Galaxy S8 Plus are still viable options for those looking to purchase a high-end smartphone. iPhone vs Samsung: Which Is Better? Both Apple and Samsung phones are great, and each come with their pros and cons. 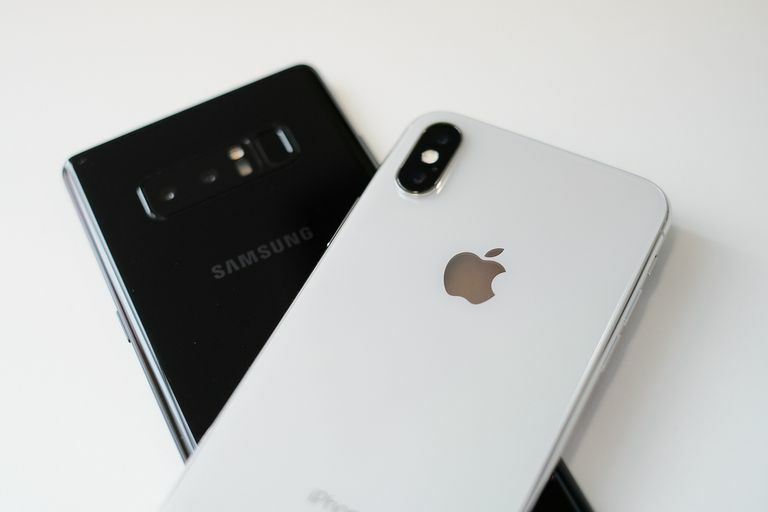 But at the end of the day, an iPhone may be ideal for those looking for a more straightforward user experience; a Samsung device may be better for power users who like a little variety. Overall, choosing a new smartphone often comes down to lifestyle and personal preference.